Lowdown: An insightful cartoon on an English man, his dog, and their position on nature and the environment. From the team that brought us Chicken Run and lots of TV stuff like Creatures Comforts comes a feature film (that is, a bit more than 80 minutes) featuring the familiar Wallace & Gromit characters. Familiar, that is, from various short films. As this film is an animation film, composed entirely of play-dough stop & go animation, it is automatically labeled a kids' film. You realize that immediately once you encounter the storm of teasers knocking you down when you stick the DVD up your DVD player, in an effort by those lovely film companies to have kids torture their parents to death asking for more DVD's. However, there's more to this film than meets the eye; children will hopefully like it, but it has definite adult appeal, too. Wallace is a food old fashioned English chap, who together with his dog Gromit runs a pest control operation - Anti Pesto - helping the local English town look after its collection of giant fruits and vegetables collection, prepared with much sacrifice for the yearly competition at the local grand estate. 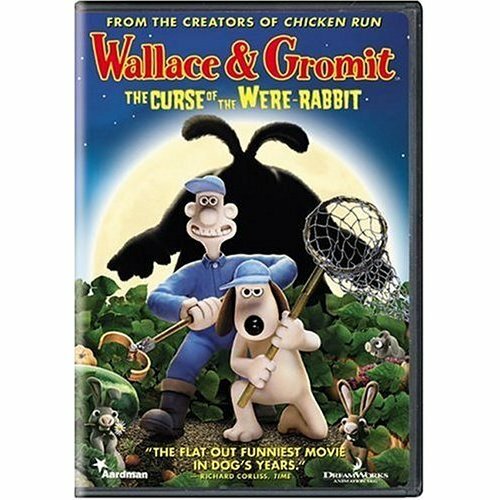 Wallace is a good old chap and he just can't bring himself to exterminating all the rabbits he collects at work, so he and Gromit collect them all at their house. Wallace is also a technology freak, and he comes up with this design for a mind bending machine to use on the rabbits so that they'd avoid harming the town's fruits and vegetables. Alas, his Frankenstein like operation of twisting nature fails, and as a result the town is now facing an even greater danger: were-rabbits. Wallace is called to fend off the new curse, vile hunters and superstition in the process. But as is usually the case with such films, salvation comes from the unlikely Gromit, who turns out to be the resourceful sidekick that saves the day without asking for any of the glory. If asked to describe the film in one word, I would say charming. It's not a roller coaster ride of laughs the way, say, Top Secret was; but it is full of subtle funny anecdotes, such as things taking place in the background that you don't notice until you watch the film the third time. It is also full of character, and unlike the production line cartoons of late - say, Over the Hedge - it is not just a pointless mind numbing collection of pop culture anecdotes, but rather a well told story in a well portrayed old-English environment with well developed characters. It's not a copy of other films; it's actually creative. As I mentioned before, the film has some grownup appeal. It offers more than a bit of criticism towards conservative English-ness, ridiculing institutions such as British aristocracy, hunting and conservatism in general. But most of all it tries to tell us that we should pay respect to nature and avoid trying to outdo it with technology, warning us that such attempts are bound to fail. That said, most people will just enjoy this film for its superb imaginative animation and the occasional funny joke. Best scene: Gromit is flying a roller coaster bi-plane, trying to save Wallace, while being chased by an evil dog on a Red Baron roller coaster plane. Suddenly, the coins run out and the chase scene comes to a halt. You'll have to watch it to see what I'm talking about, but this is one creative scene. Picture quality: Given the nature of the animation it's hard to tell, but overall I was quite happy. Sound quality: Nothing spectacular, but overall a nice experience. Overall: A charming 3.5 star effort. If I had kids, I would like them to watch this one rather than most of the crap that is out there for children at the moment.